This article will describe how internal-gear hubs work, starting with three-speed hubs and working up to more complex hubs. The article will go on to describe design trends and make recommendations. Links in this article are to pages with information about the specific models of hubs mentioned . Also see our main article about internal-gear hubs. Internal-gear hubs have been used on bicycles since before 1900. Three companies build them today. Sturmey-Archer has a heritage dating back to the first decade of the 20th century. Shimano has manufactured internal-gear hubs since 1957 and Rohloff is a relatively new company with a technically very advanced hub. SRAM, with a heritage going back to the early 20th century, recently discontinued producation of internal-gear hubs. Hub gears are generally somewhat heavier and/or less versatile than derailer gears. On the other hand, hub gears can be more rugged and immune to contamination, and can shift when the bicycle is stopped – of special importance in urban stop-and go riding. Hub gears have offered indexed (detented, “click”) shifting since their first appearance. Some even offer a reverse gear, useful on a tricycle, or fixed (non-freewheeling) gearing, preferred by many cyclists. Hub gears, unlike derailer systems, accommodate available full chain cases, greatly increasing the life of the chain and preventing soiling of clothing. Belt drive is also possible with an internal-gear hub. Many internal-gear hubs use one or two rods which slide lengthwise inside the hollow axle, each engaging an axle key which protrudes from a slot in the axle and moves internal elements of the hub lengthwise along the axle. 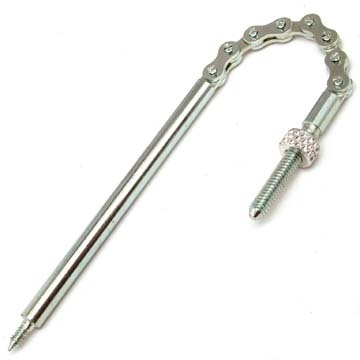 The rod is connected to a shifter cable by a pullchain or a bellcrank mechanism at the end of the axle. 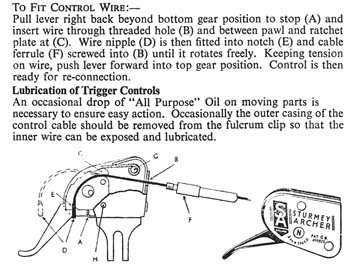 Sturmey-Archer calls the rod and chain assembly an indicator spindle. Many newer hubs instead route the cable around a pulley inboard of the right dropout. Rotation of a sleeve that encircles the axle engages or retracts a pawl or ratchet, or operates a cam that shifts elements lengthwise along the axle. With a rotary shifting mechanism, the cable attachment is better protected, but the internal mechanism becomes more complicated. The Sachs Elan 12-speed hub used rotary shifting, controlling tilting of shifter rods which encircle the axle, allowing pawls to engage the axle as shown in the photo below, or to slip past. The traditional control for an internal-gear hub is a trigger assembly with a clamp band which can be fitted to any handlebar. Some hubs use twist-grip controls which fit only flat handlebars -- drop bars have a slightly larger diameter. Aftermarket solutions are available for some hubs, and do-it-yourself solutions may be possible. a ring gear (or gear ring -- same thing) with teeth on its inside. Cutaway of Sturmey-Archer 3-speed hub gear. The sun gear, planet cage and ring gear are coaxial, and so input and output may easily trade places or bypass the gearing, giving increase, unity and decrease ratios. Though each planet gear engages two other gears, power loss is minimized because the planet cage turns more slowly in the same direction as the planet gears, reducing the speed at which the planet-gear bearings turn and at which gear teeth engage and disengage. Efficiency will be discussed at greater length later in this article. A simple planetary system with a stationary sun gear cannot have a step-up ratio as great as 2:1 -- the planet gears would become infinitesimally small and turn infinitely fast; a step-down ratio cannot be as low as 1:2. While a unity ratio, 1:1, is possible by bypassing the gearing, the axle gear would be infinitesimally small for ratios very near 1:1. Similarly, if the ring gear is held stationary and the sun gear drives the planet cage, the drive ratio must be between zero and 1:2 but not close to either. If the planet cage drives the sun gear, the ratio must be between 2:1 and infinity but not close to either. The third possibility, that the planet cage is held stationary, offers only reverse gears and is used only in a few geaboxes for tricycles. The common three-speed hubs from Sturmey-Archer, SRAM and Shimano have a single-stage, simple planetary system, with the sun gear locked to the axle. Shifter parts direct power through the planetary system in either direction for step-up and step-down ratios, or drive the hub shell directly for the middle, unity ratio. Both Sturmey-Archer offers three-speed hubs with splines to fit a Shimano-standard cassette, for multi-speed hybrid gearing. These hubs eliminate the need for a front derailer and are especially suitable for small-wheel bicycles: the step-up top gear avoids the need for an oversize chainwheel. SRAM used to offer these hubs. (no longer produced, but Sturmey-Archer makes as similar one). A planetary system may have stepped (compound) planet gears. A compound planet gear is two or more gears, side by side on the same axle, made in one piece so they turn at the same speed. Each section has a different number of teeth. One set of teeth engages the hub's ring gear and a sun gear. A different sun gear engages each additional section of the planet gears. Locking one or another sun gear to the axle achieves different ratios, possibly including ratios outside the range achievable with simple planetary gearing. Most hubs with compound planet gears have a "neutral" position when between gears, as it is not possible for two sun gears to be locked to the axle at once. This issue is difficult to avoid when the same gear train is used for both increase and decrease ratios, as the sun gears cannot freewheel in either direction: there would have to be a separate, retractible pawl for each direction of rotation.. Compound planet gears must be timed to engage all of the sun gears correctly, otherwise the teeth engaging one sun gear will be out of step with those engaging another, causing rough running and possible damage. The planet gears will have a mark somewhere to indicate how they are supposed to line up. The groove on the gear above is one example of such a mark. The image below shows the timing of the planet gears of a Sturmey-Archer Sprinter 5 hub as they are installed in the hub's planet cage.. The marks must all face directly outward. Sturmey-Archer and Sachs/SRAM 5 speeds. Sturmey-Archer and Sachs/SRAM have made several models of 5-speed hub using single-stage compound planetary gearing. Low, middle (unity) and high ranges are selected as in the three-speed hubs, but the low and high ranges offer two speeds each. The small end of each planet gear engages the gear ring and one sun gear. The large end engages a second, smaller sun gear. With the larger sun locked to the axle, the hub operates as a simple planetary system. Locking the smaller sun gear to the axle selects a narrower range. Early Sturmey-Archer and SRAM 5-speed hubs used a shifter rod and cable on the right side for the decrease-unity-increase function, and another on the left for the wide-narrow function. More-recent 5-speed hubs use a single shifter and cable, simpler for the user but requiring a more complicated connection to the internal mechanism. Sturmey-Archer and SRAM 7-speeds (both now discontinued) are very similar to the 5-speeds, except with 3-part stepped planet gears. The ring gear engages the middle set of teeth of the planet gears. With all of these hubs, the smallest section of the planet gears must have enough teeth for acceptable strength and wear life, limiting the hub’s range. Multi-stage planetary gearing offers more flexibility than single-stage gearing, at some expense in efficiency. In one approach, all three elements of a planetary system are in motion: the sun gear is turned forward or backward by a second planetary system. Several mid-20th century narrow-ratio Sturmey-Archer hubs used this approach to achieve ratios near unity. Intended to appeal to racers and avid recreational cyclists, these hubs had only three or four ratios, and lost out in the market to derailers, which could offer narrow steps, but also, more ratios. The very elaborate Sachs Elan 12-speed hub from 1995 also had all three elements rotating, as did the SRAM i-Motion 9 -- both now discontinued. More than one planetary stage may also be used in series, overcoming limitations of single-stage planetary gearing -- a common approach with newer hubs. 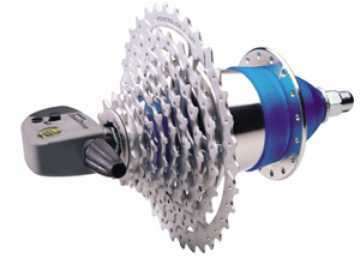 The first common hub to use stages in series was the Shimano Nexus 7-speed. This hub uses two stages. The first stage gears down, and the second, up. Each stage has two-part compound planet gears and two sun gears, offering two different ratios, or a unity ratio. In the middle three of the hub’s seven gears, power passes through both stages, and so the hub does not use the unity ratios of both stages at once; rather, it achieves a near-unity ratio by gearing down and then up through two ratios that are nearly complementary, avoiding an awkward shift. The Nexus 7-speed was the first common hub with rotary shifting. Though often praised for its smoothness of shifting, its protected cable connection and its even progression of ratios, the Nexus 7-speed has been criticized for low efficiency in the middle gears, and for short wear life due to the small sun-gear pawls. Newer models of this hub may have improved reliability. Only to gear up or gear down (besides unity ratio) is usual with 2-speed hubs, some of which shift when the cyclist backpedals – making them especially suitable for take-apart and folding bicycles where a cable would pose a complication. But also, Sturmey-Archer once made, and now (2010) has again introduced, a three-speed fixed-gear (non-freewheeling) hub. The fixed-gear hubs only gear down, because the planet cage, which drives the hub shell, must be permanently attached to it. Because there is no freewheeling, these hubs must have a "neutral" between gears. The Shimano Nexus 4-speed hub has a unity ratio and three increase ratios. It uses three sun gears, each meshing with a different set of teeth of the compound planet gears. If no sun gear is locked to the axle, the hub operates in its lowest, direct-drive unity ratio. Each of the other sun gears selects a different higher ratio. The pawls that drive the hub shell in the step-up ratios override those for the unity ratio. Like the 7-speed, the 4-speed has a rotary cable connection. There is no "neutral" gear: the hub defaults to a lower gear if the next higher one is not het engaged. The Shimano 8-speed is very similar to the 4-speed, but has a preliminary stage which either operates at unity ratio or gears down, doubling the number of speeds. This hub’s sequence of ratios is rather uneven; the steps from first to second and fifth to sixth are wider than the others, due probably to the difficulty of achieving a ratio near unity with a single stage. Efficiency is highest in the fifth gear, which is unity ratio. The Sturmey-Archer 8-speed hub has three simple planetary systems, each with a different increase ratio. The hub achieves 8 speeds by using 1, 2 or all 3 of the planetary systems in series, or bypassing them all for the unity ratio. Consequently, the lowest gear is most efficient, and the top gear, which uses all three planetary systems, least efficient. On a conventional bicycle, this hub must use an unusually-large sprocket and a small chainwheel, but on the other hand, this hub is especially well-suited to a bicycle with small wheels. The first model of this hub offered had a total range of 3.05. The current (2010) version has a total range of 3.24, and steps of approximately 14% except for the outermost steps of 30%. A second-lowest ratio closer to unity would require a small sun gear that would reduce reliability of the hub. Shifting is by locking none, 1, 2 or all 3 of the sun gears to the axle. When a sun gear is unlocked, the stage operates at unity ratio. When a sun gear is locked to the axle, the stage gears up, overriding the pawls used for the unity ratio. There is no "neutral" gear, as the hub defaults to the next lower gear. This hub uses a rotary shifter-cable attachment inside the right-side dropout. The Sachs Elan, no longer available, was the first internal-gear hub which tried to rival modern derailer gearing. It has its own page on this site. The currently-available Rohloff Speedhub has 14 speeds, with even steps of 13% each and an overall range of more than 5 to 1. The Rohloff is marketed as a replacement for a wide-range derailer system, competitive in terms of weight and efficiency, and superior in reliability. This hub has three planetary stages, from left to right in the illustration above. The first and second stages have two-step compound gearing with identical tooth counts. The first stage only gears down and the second stage, up. Seven of the nine possible gearing combinations are used; the two unused combinations would provide unity ratios but would transmit power through both sets of gears. The third stage has its input at the sun gear and output through the planet cage, transposing the entire range downward to double the number of available ratios. The Rohloff Speedhub is the most versatile, and by far, the most expensive internal hub available as of this writing. It revives desirable features of the classic internal-gear hubs – oil lubrication, weight-optimized construction – but it prices itself out of the urban-cycling market. Rohloff engineering of a hub with 7 somewhat more widely-spaced speeds would be an interesting prospect. As of late 2010, Shimano is offering an 11-speed hub. It is oil-lubricated. 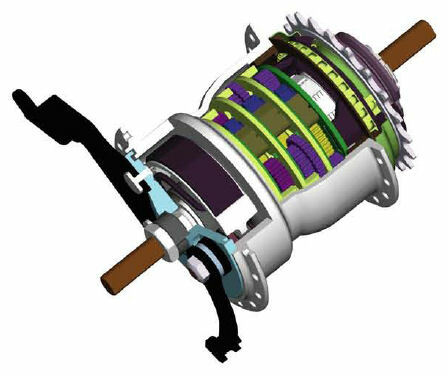 Examination of drawings and drive ratios shows it to be similar to that of the 8-speed hub, with a first stage that can gear down or operate at unity ratio, and another stage that gears up. The middle gear, however, is not at unity ratio. The first stage has helical-cut gears. No sample was available for inspection at the time of this writing. The general trend among internal-gear hubs has been toward greater complexity and expense, though simple 3-speed hubs still are available. The classic Sturmey-Archer 3-speed hub was very economical if the owner oiled it occasionally and kept the cable adjusted. Oil washed out and soiled the shell, but kept the internals clean. This hub could be serviced quite easily with widely-available and inexpensive parts. Some Sturmey-Archer 5-speed models also were reliable, as long as the owner replaced the stock shifters with a pair of Sturmey-Archer trigger controls. Thes older Sturmey-Archer hubs had a "neutral" gear between 2nd and 3rd, and could freewheel forward if the cable was misadjusted -- see comments by Jobst Brandt. That problem is resolved with current hubs of all brands. Current SRAM and Shimano 3-speeds are simple and rugged, as are SRAM 3, 5 and 7 speeds -- though the (discontinued) SRAM i-Motion 9-speed proved unreliable. SRAM has recently introduced (and now withdrawn an 8-speed and a different 9-speed whose design is simpler and appears more promising. Early Shimano 3- speeds could not withstand hard pedaling. The Shimano 7-speed would sometimes skip forward after a couple of years’ use. The 8-speed improves over the 7-speed, but is rather complicated. Reliability issues with some recent Sturmey-Archer hubs have been serious, and are discussed in more detail in our main article about these hubs. These days, all internal-gear hubs except the Rohloff and the Shimano 11-speed are grease-lubricated and lack an oil port. Grease is imperative with hubs that include a coaster brake. With most hubs, it is still possible to add oil in one way or another without disassembling the hub. It is often also advisable to relubricate a new hub before putting it into service-- see advice here. All in all, the trend has been toward less user maintenance, at the cost of more frequent service intervals and vulnerability to water contamination. Many users will simply run a hub until it malfunctions, and manufacturers have responded to that by producing hubs which have "permanent" lubrication. Bearing cups and ratchets are pressed, rather than threaded, into the hub shell, and non-replaceable. If a bearing cup is worn or corroded, the hub shell must be replaced, generally requiring replacement of the entire wheel. The entire internal mechanism must then fit through the outer bearing cup on the right side, and so that cup must have a larger diameter than any internal part, one reason that sealing against dirt and water isn't as good as it used to be. Another reason is that most dustcaps of newer hubs are less sophisticated than the double labyrinth seals of old Sturmey-Archer hubs. Hubs with more ratios are more complicated, expensive, heavier and difficult to repair. Most bike shops don't have a mechanic who knows how to rebuild these hubs -- though instructions for most are online. The usual repair is to replace the hub's internals in their entirety. Increased interest in internal-gear hubs has led to a wider variety and to hubs with more ratios. But also, it has led to frequent model changes, and to reliability problems with some hubs. Parts for some hubs only a few years old are no longer available. High efficiency is important in a bicycle drivetrain. Let’s consider the factors affecting efficiency in a simple planetary system. We’ll use the example of the common Sturmey-Archer 3-speed hub, with 20-tooth sun and planet gears and a 60-tooth ring gear. I'll give only that one example here; others may be developed similarly. Consider a single turn of the driver (the input from the sprocket), resulting in 1 1/3 turns of the hub shell, in the top gear. The driver is connected to the planet cage. As the driver makes one turn, each planet gear makes two turns as it circles the stationary sun gear, but only one turn on its axle – because the axle is rotating forward with the planet cage; also, only one turn relative to the sun gear, because it is circling the sun gear in the same direction it is turning. The planet gears advance the 60-tooth ring gear by 20 teeth. One turn of the planet gears relative to the sun gear. These gears are of the same diameter. 1/3 turn of the ring gear where it engages the sun gears. The same number of gear teeth – 20 – engage and disengage as between the sun gear and planet gears, but more teeth engage each planet gear at once, and they engage and disengage more slowly because the ring gear is an inside-out gear. Properly-formed and aligned teeth of spur gears are in rolling contact, without sliding. In addition, there is the drag on the bearings. The planet gears make one turn around their axles, which are loaded by the tangential force resulting from torque from the driver at the axles’ radius. Other forces more or less cancel due to symmetry, with each planet gear contacting the sun gear and ring gear at two locations opposite one another. The cup-and-cone ball bearing between axle and hub shell at the left side bears about ½ the weight load on the rear wheel and little of the pull from the drive chain; the hub shell turns at the output rate, 1 1/3 the rate of the driver. The smaller (outboard) cup-and-cone ball bearing on the right turns at the rate of the driver, and bears about ½ the weight load on the rear wheel, as well as a most of the pull of the drive chain. The larger (inboard) cup-and-cone ball bearing on the right, between the driver and the hub shell, is in relative motion at 1/3 the rate of the driver but has a larger diameter, increasing the linear speed between its races. This bearing also bears about ½ the weight load on the rear wheel, and a bending load due to that weight and the pull of the chain. This bearing uses smaller bearing balls than the axle bearings, 3/16 inch rather than 1/4 inch. The gears and bearings, then, add some drag compared with a single-speed system, but on the other hand, an internal-gear hub does not have drag from the chain's running over derailer pulleys or from chain misalignment. Research has shown internal hubs to be somewhat less efficient than derailer gearing, but they make up for that in urban cycling with their ease and speed of shifting. The direct-drive middle gear of an internal hub should in theory be very efficient, because power is transmitted directly to the hub shell. In practice, this gear does not always prove to be much more efficient than the others, for reasons not yet determined. Older internal hubs, as well as the Rohloff and the Shimano 11-speed, use light machine oil for lubrication, keeping drag low. Many newer hubs have more than one gearing stage, and use grease, making them less efficient. 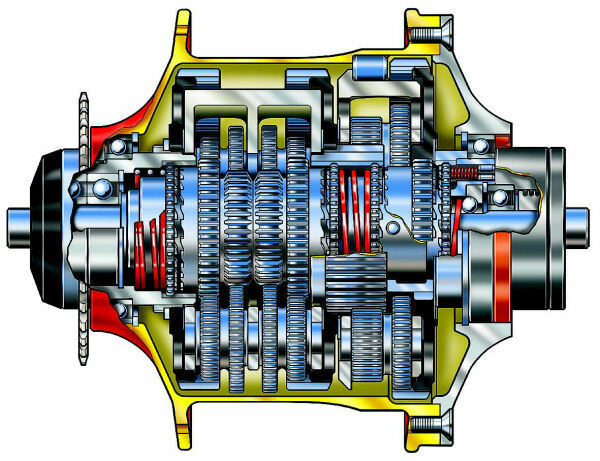 A comprehensive study of internal-gear hub efficiency was conducted by Dr. Chester Kyle and Frank Berto, and published in the journal Human Power, issue #52. It makes an interesting comparison with the examination of derailer-gearing efficiency in issues 50 and 51. Efficiency increases as chain tension or applied power increases. Kyle and Berto show lower efficiency than manufacturers claim – though it is still impressive – for the Rohloff hub. For derailer gearing, the results in issue 50, showing lower efficiency for smaller sprockets, are overturned in issue 51, when recalculated to apply to the same power, at the same wheel rpm. Wide-range, narrow-step derailer gearing (or the Rohloff hub – at a high price) makes bicycling more accessible in steep terrain, when carrying heavy baggage and for weaker riders. But for most urban utility use, a hub gear, if properly chosen and set up, has advantages that well outweigh those of derailer gears. The single-speed bicycle and the classic, overgeared three-speed were the mainstay of urban cycling for decades, but they limited the utility of bicycling. It is no coincidence that urban cycling has been most popular in cities that are very flat – Amsterdam, Copenhagen, Berlin. Even in such cities, single-speeds and overgeared three-speeds are unable to accelerate smartly or to adapt to different challenges of wind, baggage and cyclist strength. Many utility bicycles also have had only a coaster brake, with stopping distance twice that of a bicycle with a front brake. Bicycles with only a rear brake may legally still be sold new in the USA and the Netherlands, though not in other countries of the European Union. The coaster brake also impedes quick restarting by making backpedaling impossible, and it overheats on long downhill runs. I understand that dual handbrakes, usual for decades in the U.K., France, the USA and Canada, are now capturing an increasing share of the market in northern Europe. Sometimes the rear brake is a disk brake, drum brake or Shimano Rollerbrake integrated with an internal-gear hub – and unlike a rim brake, immune to wet weather. In my opinion, a three-speed with the top gear in the 70- to 80-inch range (5.6 to 6.4 meters development) is the minimum requirement for smart performance in urban cycling. I think that the preferred gearing in most urban areas has 5 to 8 speeds. A very hilly city such as San Francisco demands a wider range than a moderately-priced hub gear can offer. Hybrid gearing or an all-derailer system is less expensive than these hubs, though more trouble to maintain. Weight also figures into the choice of a hub. Light weight matters much more when a bicycle is being carried than when it is being ridden, and is especially important in folding bicycles, which are more often carried. With its three-speed and five-speed hubs in aluminum alloy shells, Sturmey-Archer still maintains the tradition of weight optimization that it established in the mid-twentieth century. Though SRAM’s five-speed and seven-speed hubs were much like Sturmey-Archer hubs internally, most were sold with heavy steel shells. Shimano stands somewhere in between. None of the hubs with more than seven speeds is very light, . My own bicycles have from one to 30 speeds, but for urban cycling, I am still riding an old Sturmey-Archer 5-speed hub. Feeling the need for a lower gear range to pull a trailer up the hill to my home, I have built up a wheel with the SRAM 7-speed model that includes a drum brake, and another with a Shimano 8-speed. I'll be trying both.. The SRAM has an aluminum alloy shell, and even with the brake, weighs only very slightly more than the brakeless version with a steel shell. The Shimano has a Rollerbrake, but I'm planning to remove this and use a rim brake instead, because the Rollerbrake drags when not in use.